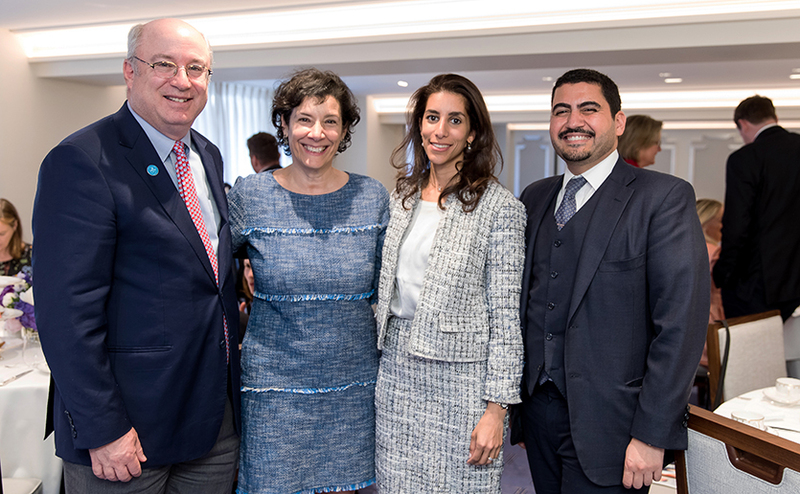 Visiting in London are, from left, Mass General President Peter L. Slavin, MD; his wife, Lori; Sarah Yamani and her husband Malik Dahlan. Grateful for their son’s care at Massachusetts General Hospital’s Lurie Center for Autism, a London family is helping the center expand its reach to the United Kingdom (U.K.) and beyond. The gift from Sarah Yamani and her husband, Malik Dahlan, is enabling the Lurie Center to ramp up its teleconferencing capacity. The goal is to provide continuing education on autism spectrum disorder to healthcare providers in the U.K. and to allow them to consult with Lurie Center experts on individual cases. The family is also backing a promising line of research that uses imaging to detect inflammation in the brain, a possible cause of autism whose exploration could lead to new treatments. Increasing numbers of families from outside the United States (U.S.) have been coming to the Lurie Center for Autism, seeking lifelong care not available in their home countries. Over the past six years, families from 16 nations — including the U.K., Chile, China and Saudi Arabia — have brought their children to the Lurie Center. Christopher McDougle, MD, visits with Seyma Soganda, a medical student from Turkey, who was at the Lurie Center for a one-month clerkship. An estimated 1 in every 59 U.S. children have this neurodevelopmental disorder, which can affect language, social skills, behavior and IQ. Observers believe the prevalence of autism spectrum disorder in other countries is about the same. “But there is a great disparity in autism awareness and services around the world,” says Christopher J. McDougle, MD, the Lurie Center’s director. Children in the U.K.and many other countries are generally diagnosed with autism later – often not until they are 5 or 6 years of age, he says. By then they have missed out on critical early intervention therapy, which has been shown to improve social and communication skills and to maximize potential. The Lurie Center was founded on the generosity of Nancy Lurie Marks and the Nancy Lurie Marks Family Foundation. It continues to depend on philanthropy to provide its costly, multidisciplinary care, at least half of which is not covered by American health insurance. There have been hard moments and hurrah moments, Ms. Yamani says, but their son Hamza is thriving. The Lurie Center’s evaluation and treatment plans pool the perspectives of physicians, psychologists and nurses, along with those of educational consultants, behavioral consultants, speech-language pathologists and physical and occupational therapists. Lurie Center faculty present their findings at conferences around the world. Medical students from overseas come to the Lurie Center for one-month clerkship experiences, sponsored by Harvard Medical School. Sarah Yamani and Malik Dahlan’s third son is named Hamza. As a toddler, he “made eye contact, spoke in sentences, and would ask me to sing for him,” his mother recalls. But shortly after the boy turned two in 2014, “It was like a switch had been turned,” she says. Hamza stopped speaking or seeming to understand language. He stopped responding to even his name. After a couple of referrals in the U.K. didn’t result in a diagnosis, the family reached out to Dr. McDougle. An intensive week of appointments with him and other specialists was scheduled. On the last day, all the specialists gathered in a room with them to present the diagnosis and treatment plan. “There was a lot of hand holding that week — and shock at hearing the diagnosis,” Ms. Yamani recalls. The couple had to build their own team when they returned to London as nothing like the Lurie Center’s approach existed there. Determined to change that, they initiated the Autism Center of Excellence in the U.K., a transatlantic partnership with the Lurie Center and Mass General. Ms. Yamani’s goal is to bring the Lurie model of care to the U.K. and increase awareness about the importance of early diagnosis and intervention. Reports about Hamza, now 7, are exchanged regularly between the London and Lurie teams and the family returns to Boston for his yearly evaluation. There have been hard moments and hurrah moments, Ms. Yamani says, but Hamza is thriving. He is enrolled in a mainstream school. He’s speaking and can read and write. She attributes much of her son’s progress to the Lurie Center for Autism. For more information on how to support the Lurie Center for Autism, please contact us. Help advance groundbreaking initiatives in autism care and research.